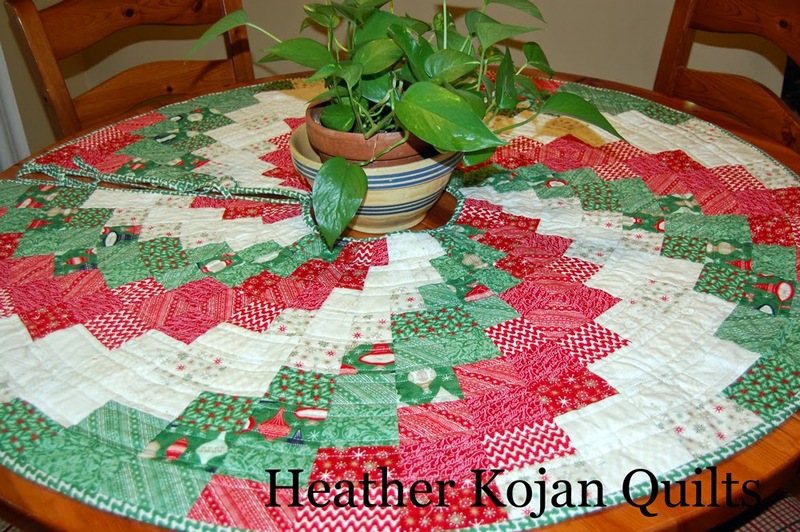 Hello, Karin Vail from Cascade Quilts back again this month with yet another Christmas in July project! 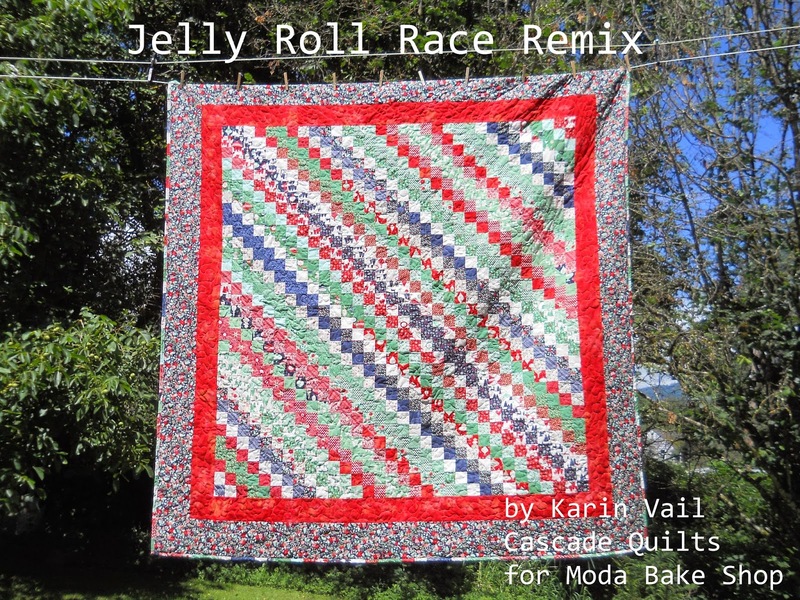 Probably most quilters have tried this at one point or another – a ”Jelly Roll Race” (JRR) quilt top. 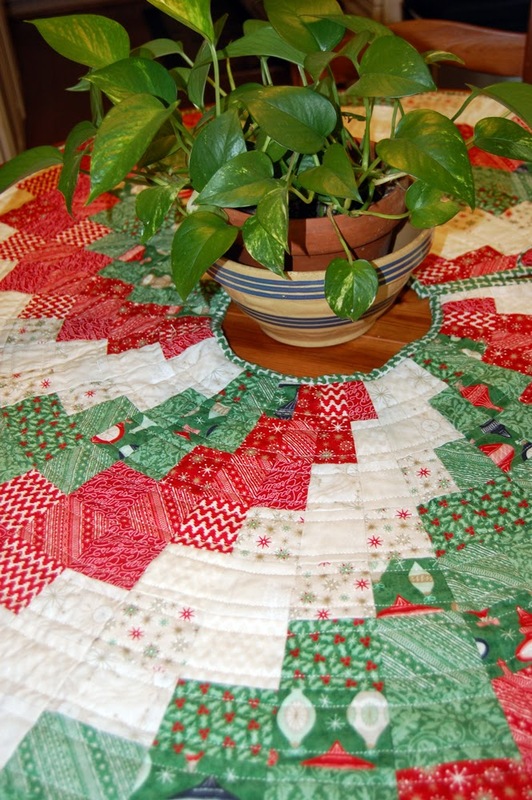 It works up fast for sure – but makes a rather ho-hum quilt. I made one myself years ago, but it was not ever destined to be made into a quilt after I finished the top and didn’t love it. 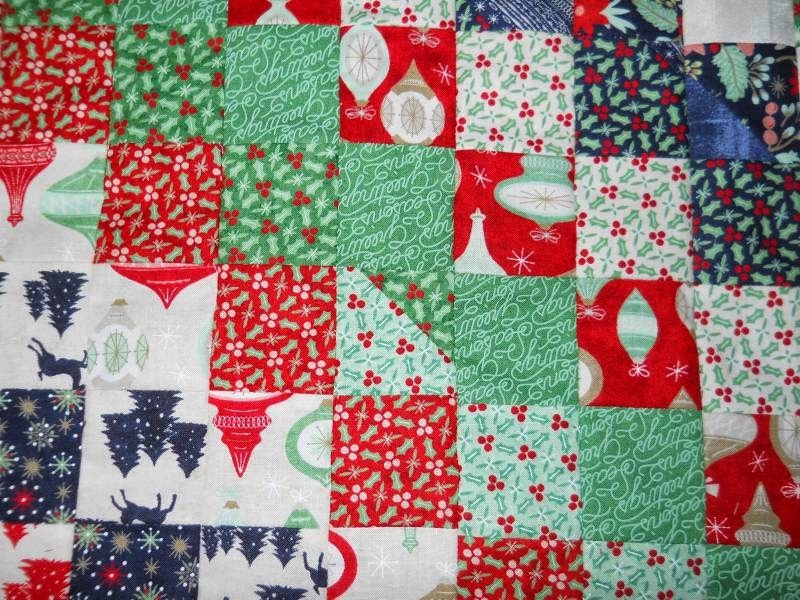 So, WHAT do you do with a JRR quilt top that you love the fabric, but don’t love the design? 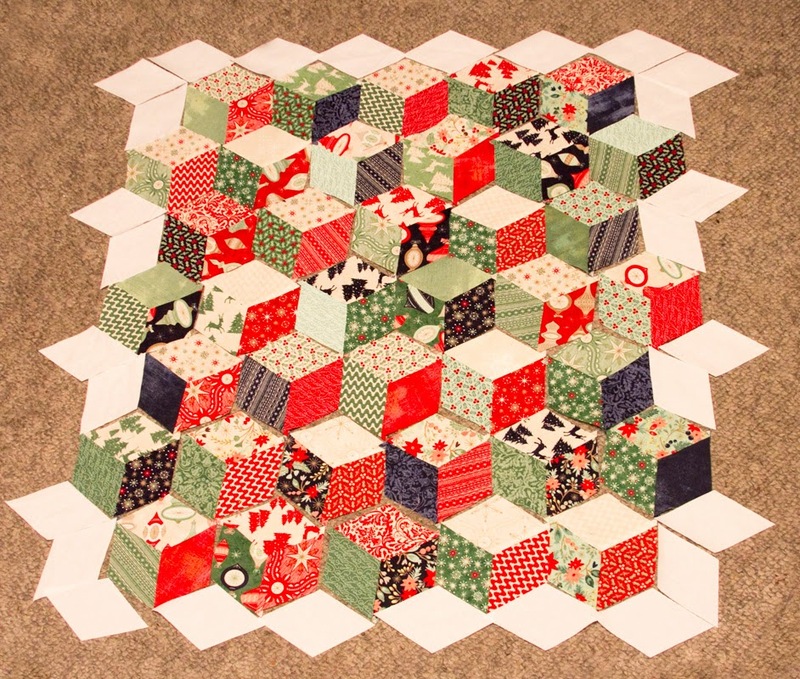 Rework it by adding yet another JRR top to the mix…..
Now, there are lots of JRR quilt tutorials out there, so I am not going to go into how to make those. 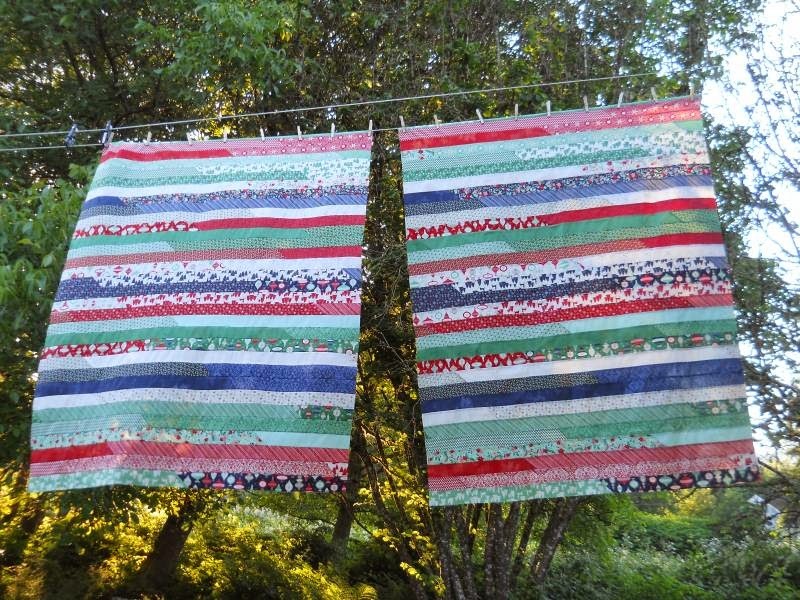 What I am going to explain is how I remade these two JRR tops into a beautiful quilt with MUCH more visual interest! These JRR tops will each measure around 50”x64” to begin with. Yes, I made TWO identical JRR tops, but you could certainly make two different tops and use this same technique. 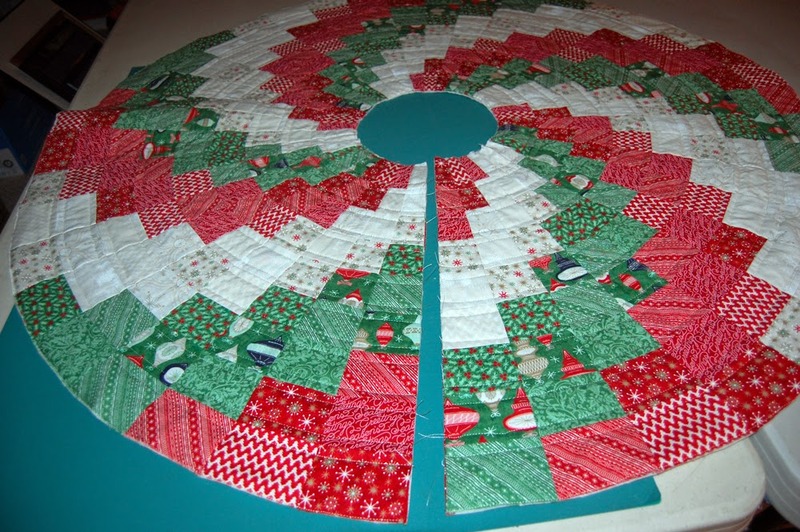 It is similar to a ‘bargello’ technique. If you did this, I would alternated between strips from the two JRR tops to get a uniform look throughout. First, take one JRR top and fold it in half so that the top strip can be sewn to the bottom strip – so you make a JRR ‘tube’. Think of it like a *giant* trip-around-the-world block setup. From that tube, you will cut cross-section strips. Here the seam has been sewn to make the tube and it’s again folded in half horizontally so I can do the subcutting. 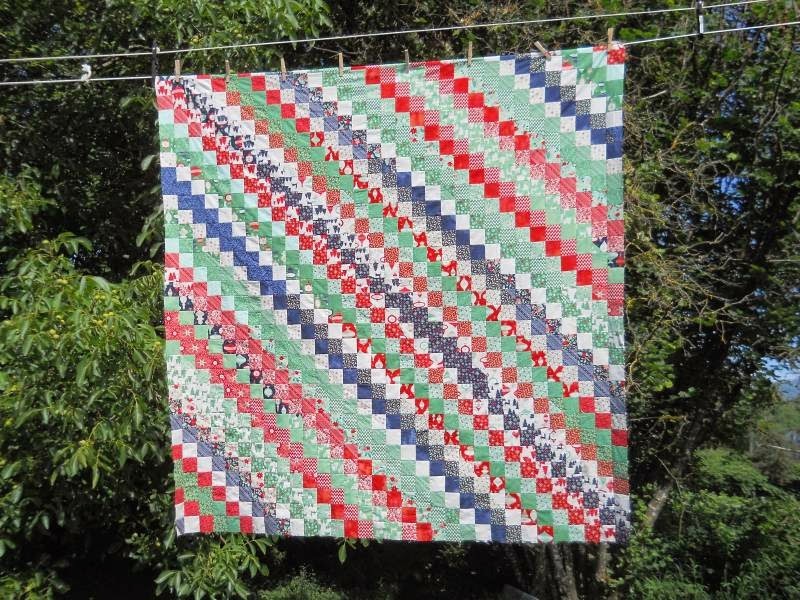 In this quilt, I cut my strips 2.5” so that I have 2” squares in my final quilt, but you can certainly change it up and cut varying widths of strips! 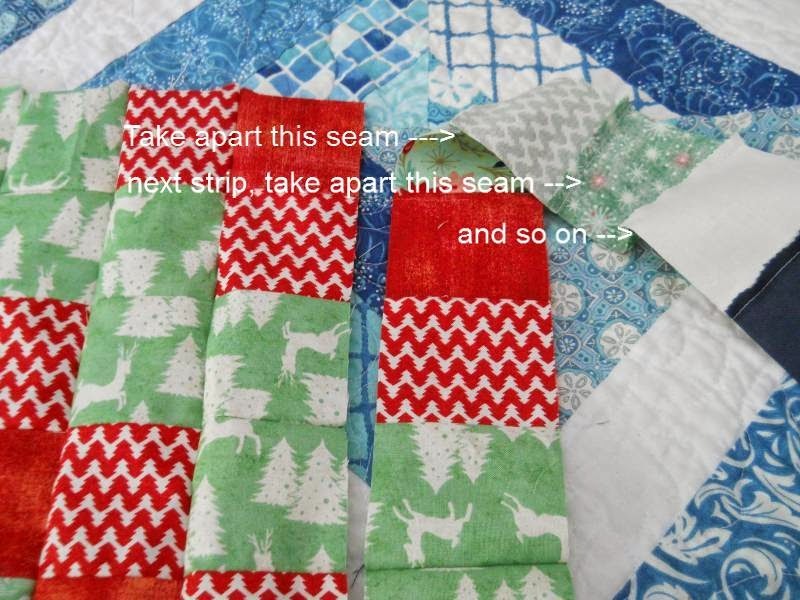 For the first strip, take apart one seam between blocks. The next strip, you will take apart the next seam up from the one you took apart on the first strip, and so on. To make it easier to keep track and keep them in the right orientation (how they came off of the original JRR top), I cut only a few strip tubes at a time and sewed them a few at a time. 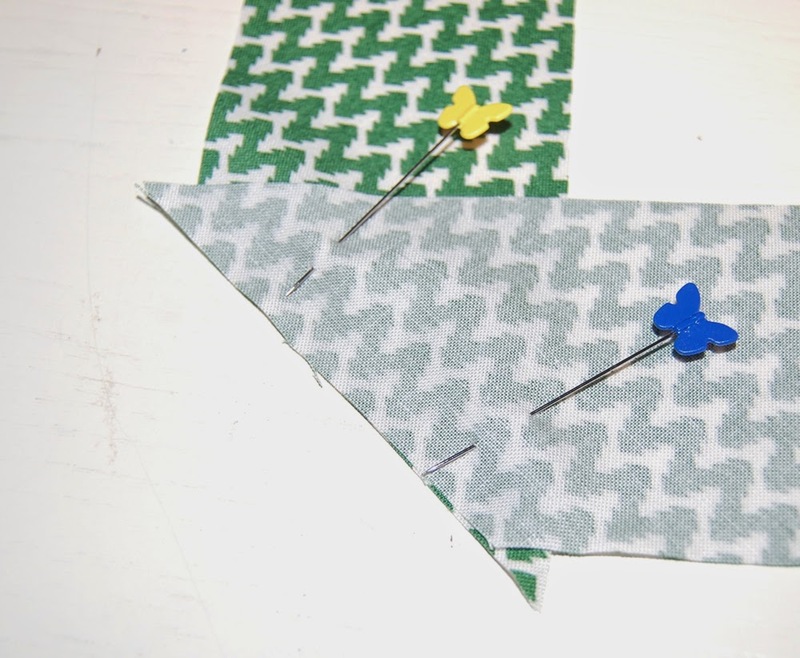 Match up your seams and sew the long verticle seams. You should be able to get twenty 2.5” strips from each JRR ‘tube’, so with two ‘tubes’ you would be able to get a total width of 80” if you used it all. But, since the length of the quilt is only 64” at this point, and I didn’t want an 80×64 quilt, I decided to stop at 64” wide and add borders to enlarge it and have a balanced quilt. 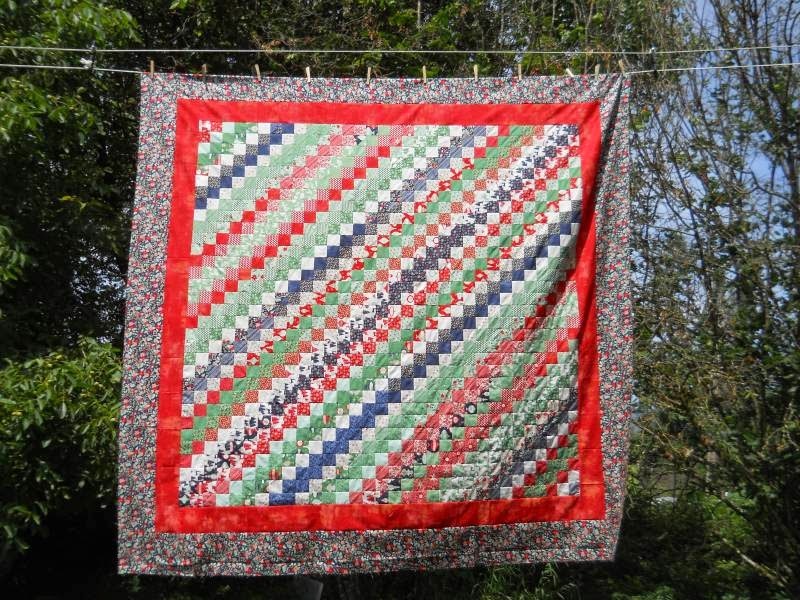 I personally prefer a square quilt since you don’t have to worry which side is ‘up’ that way 🙂 If you are using 2 identical tops, cut 20 strips from one top, and 12 from the second. If you are using 2 different JRR tops, then cut 16 strips from each JRR ‘tube’. 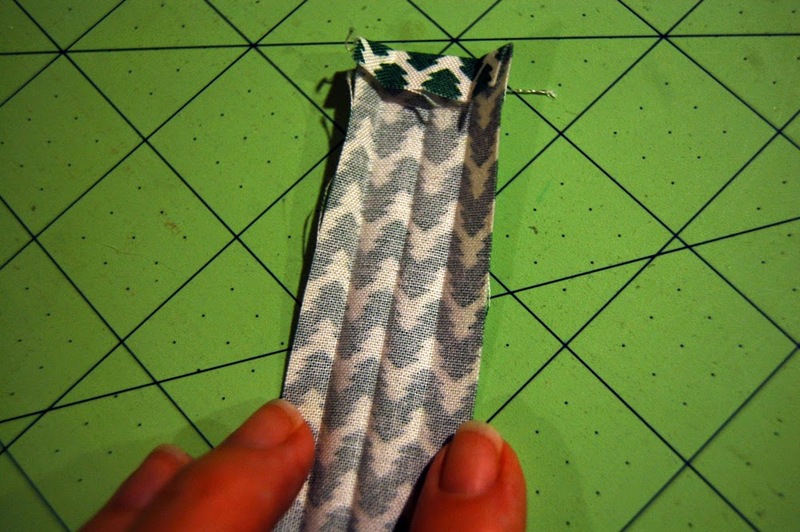 Now, take your 8@ 4.5”WOF strips and sew them into pairs to create 4 longer strips. 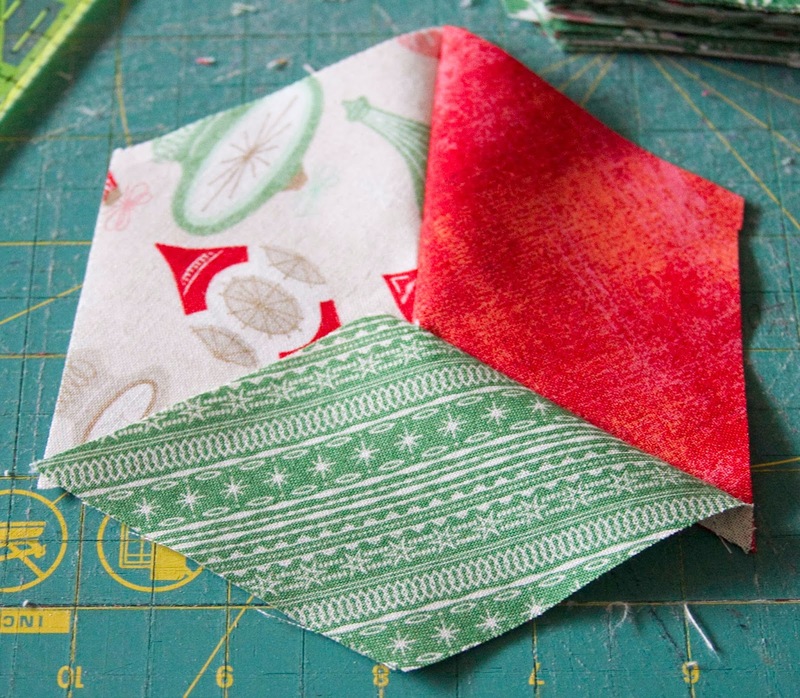 Measure your quilt top, cut border fabric to match, and sew the border on top and bottom. Mine measured 64.5”. 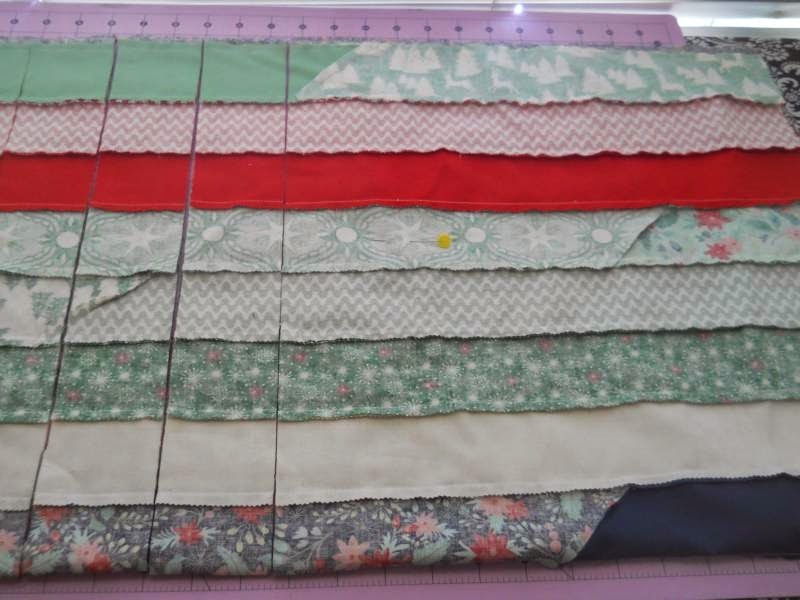 Press, measure the length you will now need for the sides and cut your remaining border strips to length, and sew on left and right sides. Mine measured 72.5”. 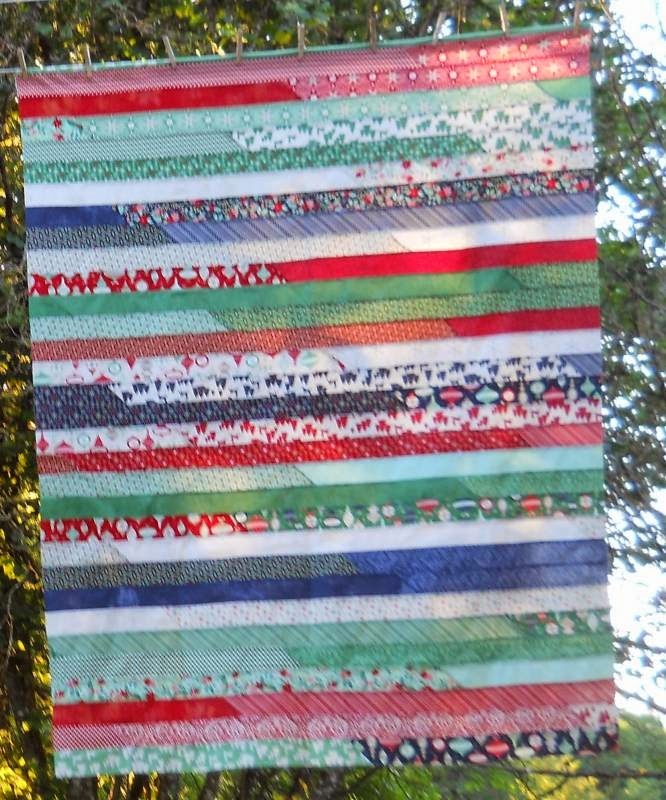 For your second border, take your 8@ 6.5” strips and sew them into pairs. 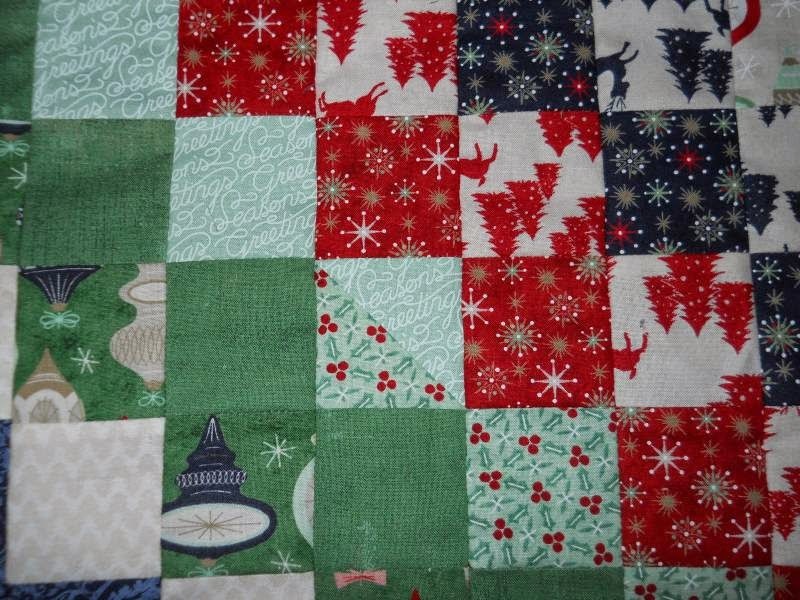 Again, measure your quilt top as per the first border. My first measurement for the top/bottom was 72.5” and second for the sides was 84.5”. So, this is truly made in July, and nary a Christmas tree to be seen. 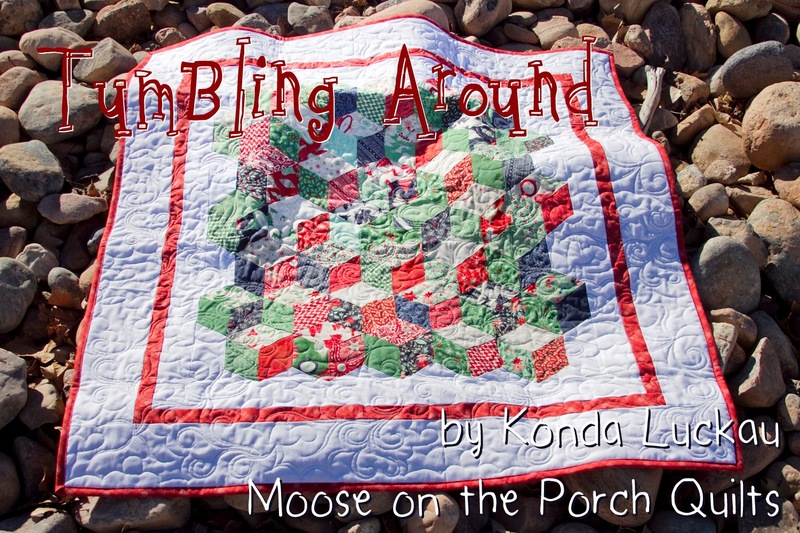 So, here you have the perfect basketball hoop skirt! 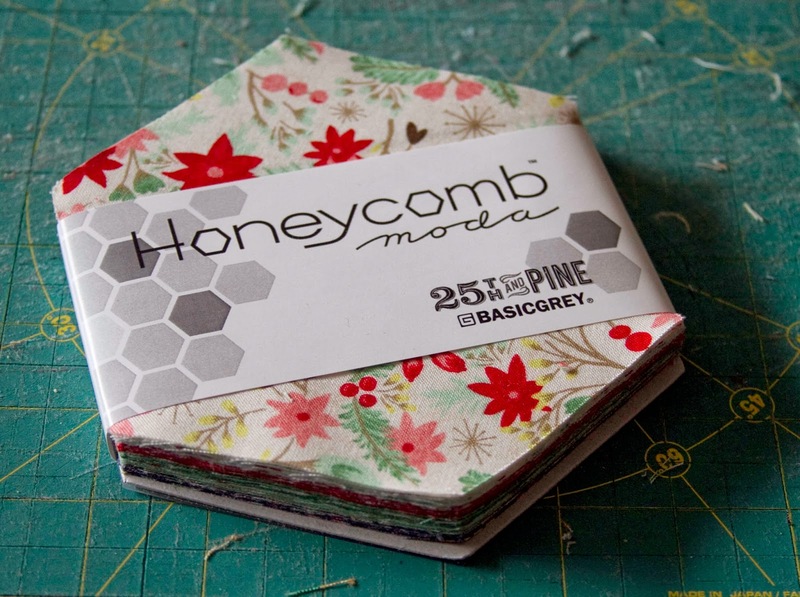 I’m using the fabulous 25th and Pine from Basic Grey. I love the feel of this fabric. So luxurious. 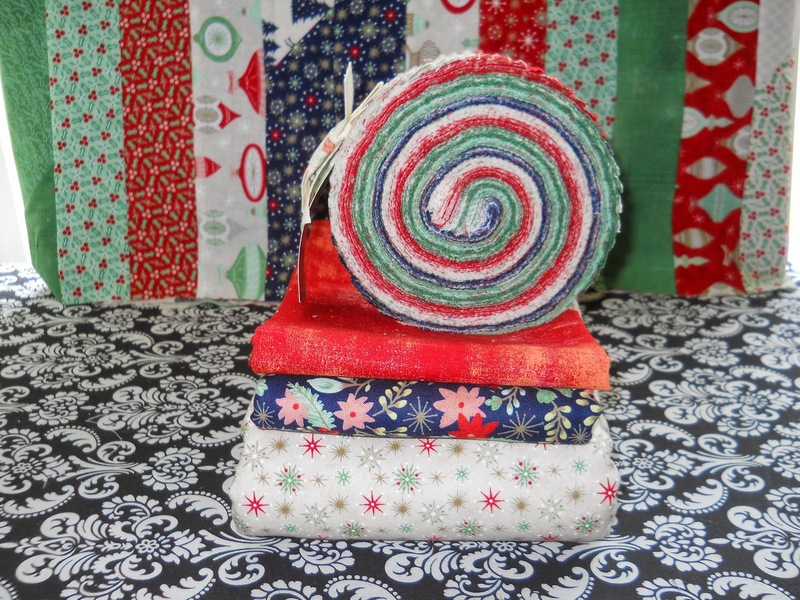 You’ll need 12 fat quarters to make your swirl: 4 green, 4 red, 4 white. 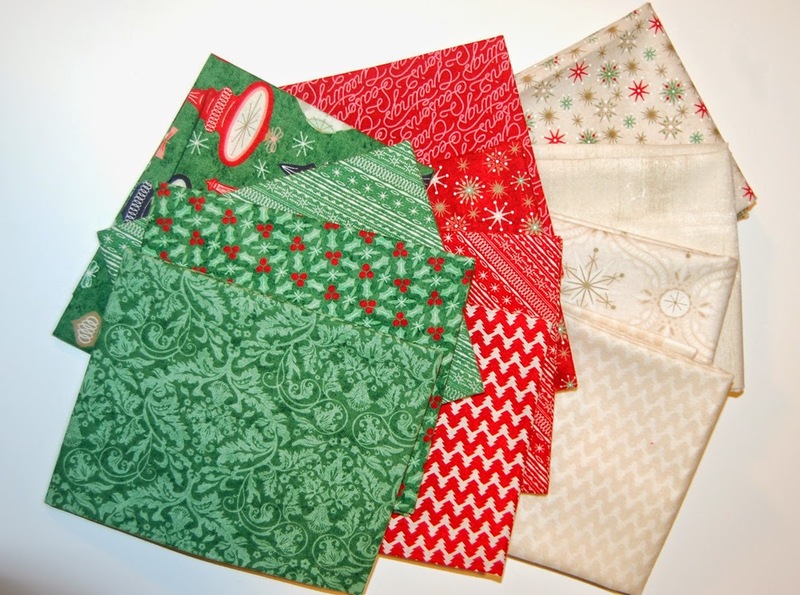 Take each of your fat quarters and cut into strips, 2.5″ x 22″. 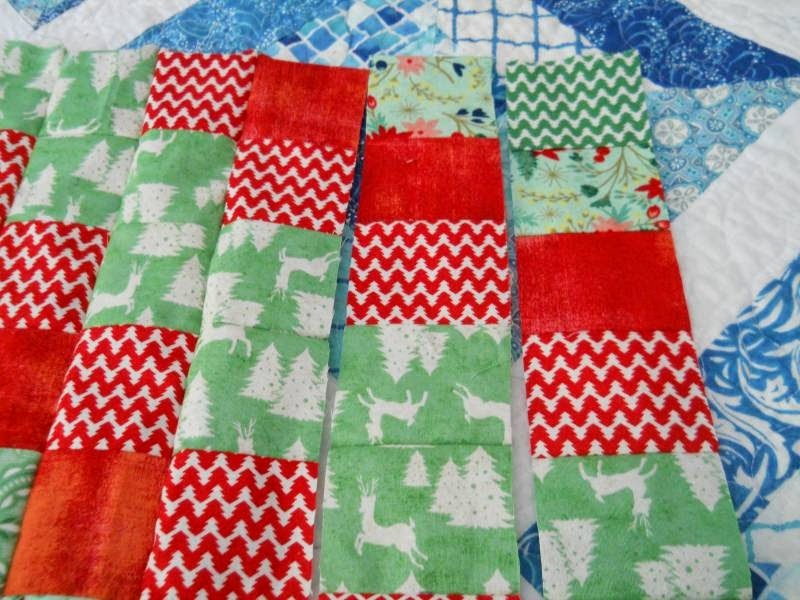 You should get 7 strips from each fat quarter to yield 28 strips of each color. Next we’re going to make strip sets. Following the chart below, we’ll make 9 unique strip sets. R=Red, G=Green, W=White. 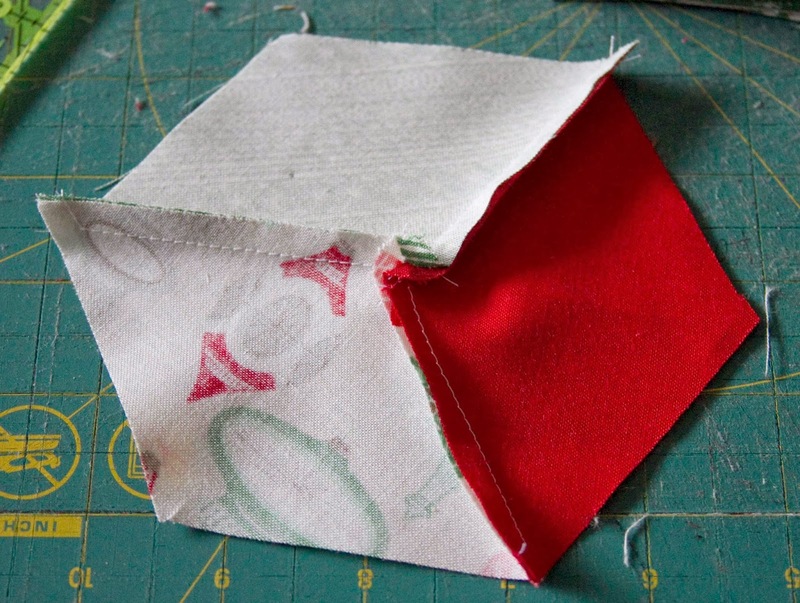 Use a 1/4″ seam allowance throughout this project. 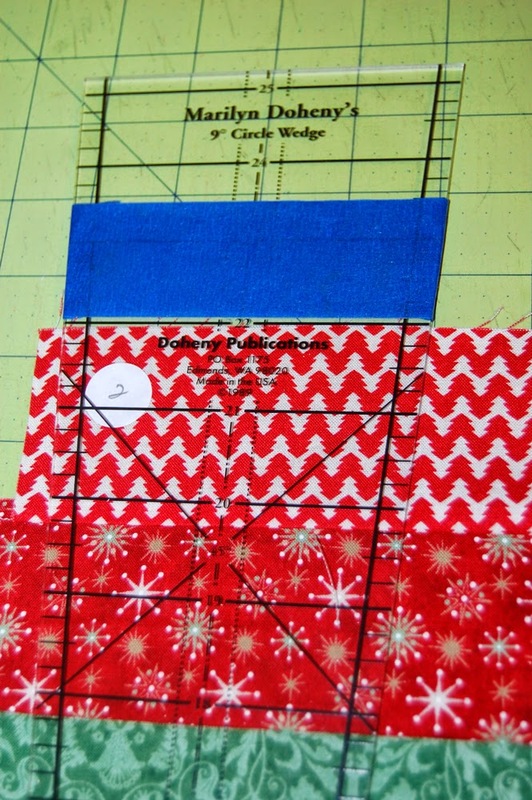 Sew your first strip set together, using the chart above. A finished strip set should measure 22″ wide and 18.5″ top to bottom. 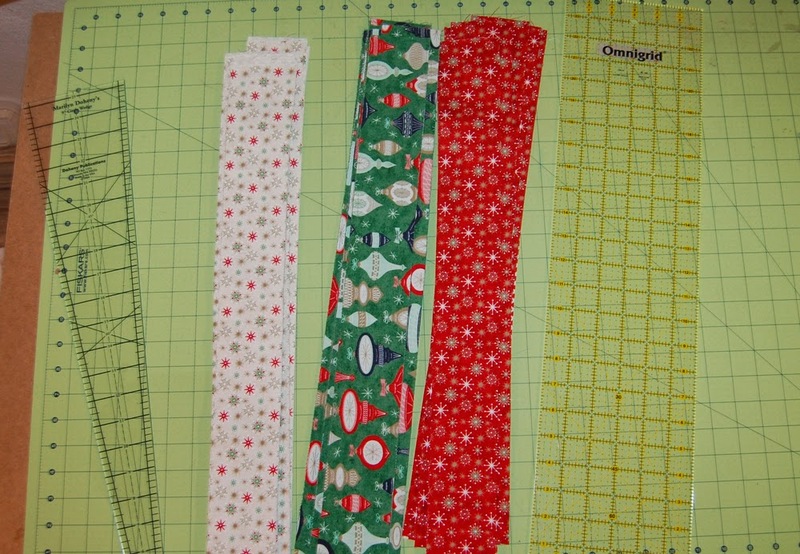 After you sew your first strip set, lay out the next strip set beside the first. Try to avoid having the same fabrics next to each other. 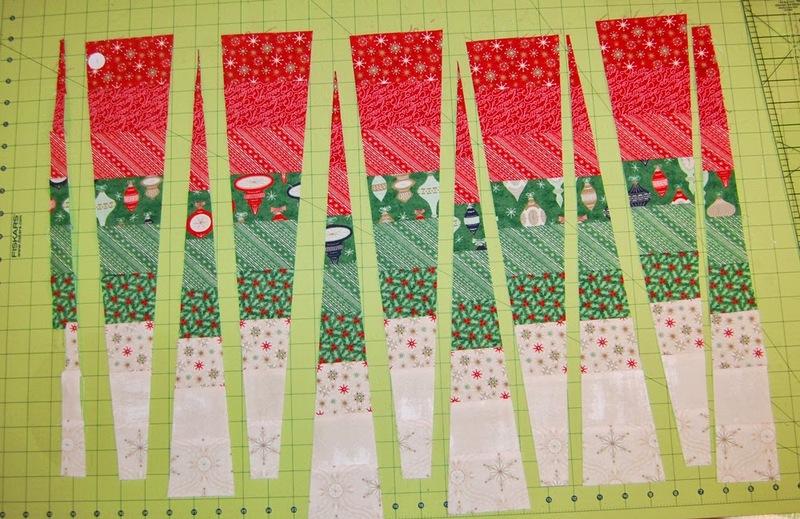 Label your strip sets 1-9 as you sew them. Press the odd numbered strip sets in one direction, and the even numbered strip sets in the opposite direction. 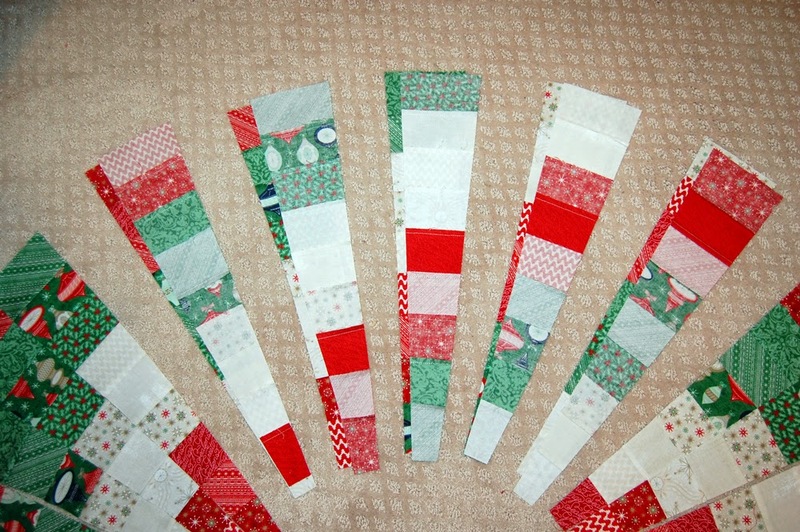 After sewing all of the strip sets, you should have one leftover strip of each color. Now it’s time to cut your wedges. You need to get 5 wedges from each strip set. Place the ruler so that the 22″ mark is aligned with the top edge of your strip set. Use your seam lines on your strip set and the lines on the ruler to make sure your ruler is placed correctly and everything is lined up straight. It’s helpful if you can place your cutting mat so that you can walk around it to make the cutting easier. Cut your first wedge. Re-position ruler at the top edge, and cut your second wedge. Repeat to make 5 wedges total. Stack the wedges (I clip them with a wonder clip) and label stack #1. You’ll end up with smaller “waste” wedges as you cut. Save these for creative play later! Continue to cut your wedges from each strip set. Label and keep in order. Let’s sew the spiral. I like to sew 8 wedges at a time. 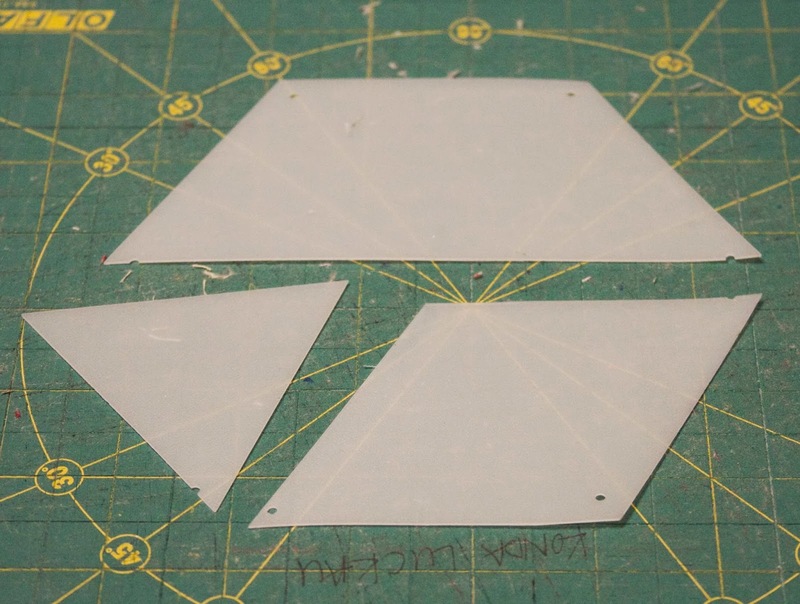 I pair the first 2, second 2, third 2 and fourth 2 by laying the right sides together. At my sewing machine, I sew the first pair, then 2nd, 3rd and 4th, chain stitching as I go. Because we did alternate pressing, the seams should nest together nicely. 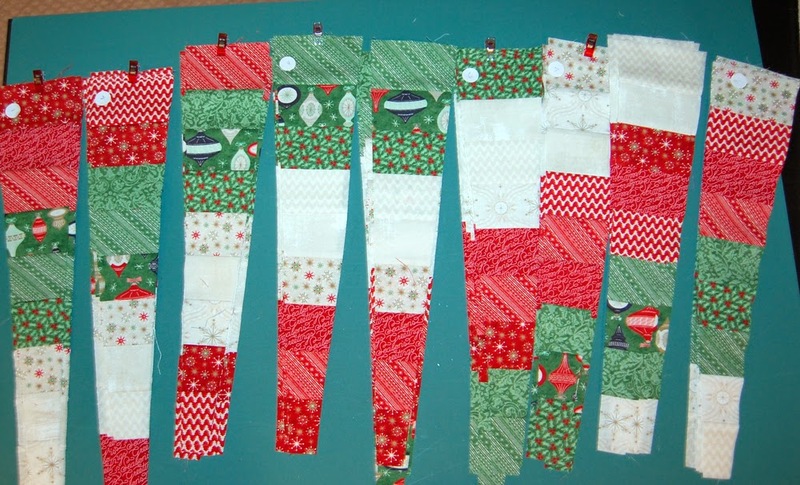 I then sew the first two pairs together, then the last 2 pairs together, and finally the 2 four wedge units together. Then I take this unit and return it to the spiral. Repeat for the reaming wedges. 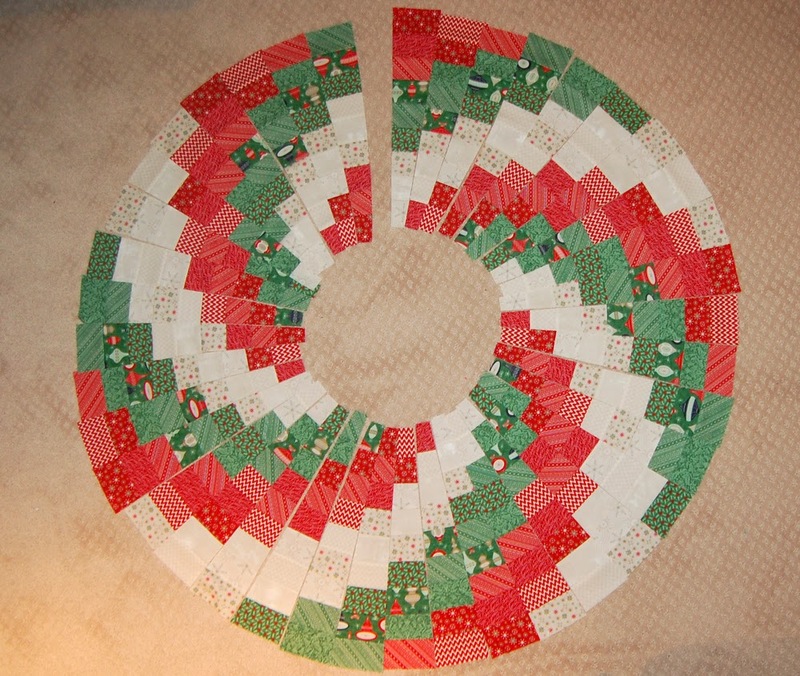 Once I have all 5 eight wedge units sewn, I check to make sure the spiral is continuous and nothing got out of order. 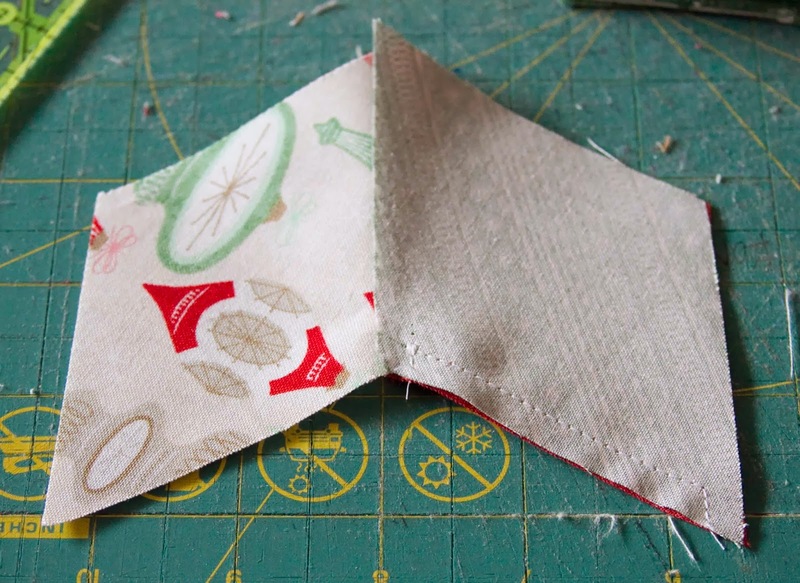 Then I sew all the units together, including the seam where the end meets the beginning. I mark this seam with a pin. Pretend there’s only 4 pairs of wedges above! Back at the sewing machine, I do a little stay stitching around the inside and outside circle to keep the stitches from “popping”, about 1/8th inch from the edge. 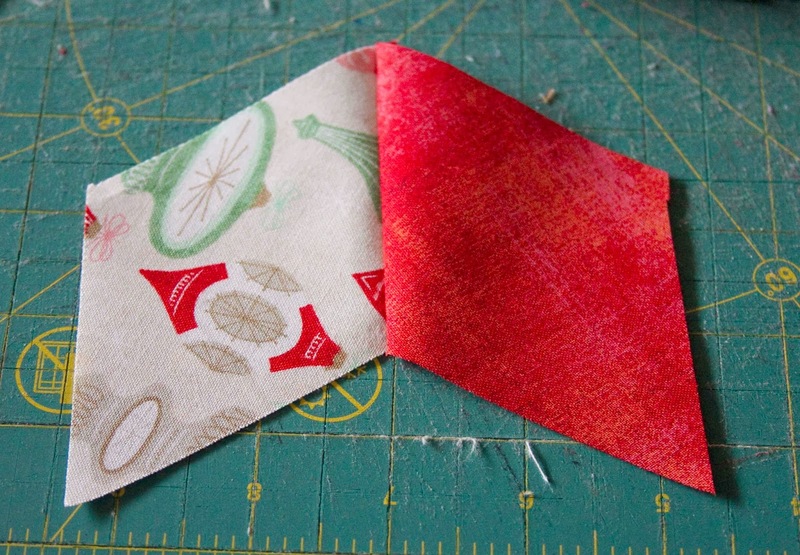 Cut your backing fabric into two pieces, 54″ in length x width of fabric. Trim selvages and seam the two pieces together. 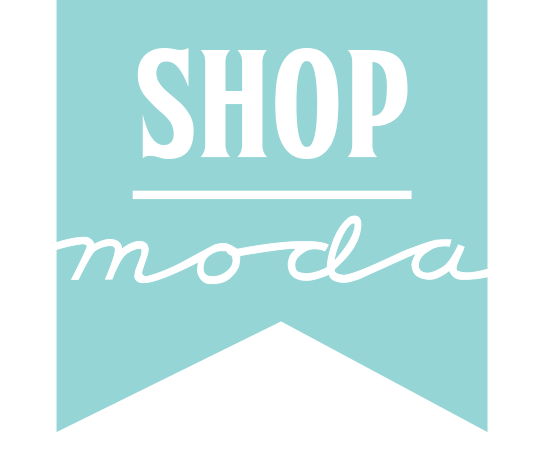 You’ll have a piece of fabric 54″ x 80″ (approximately). Trim to 54″ square. Layer your backing, batting and skirt top. Baste as preferred. 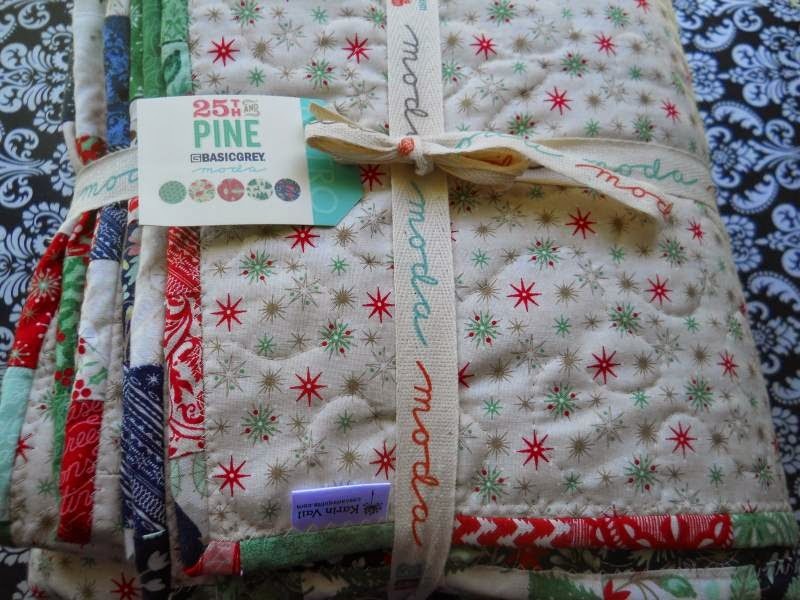 Time to quilt! 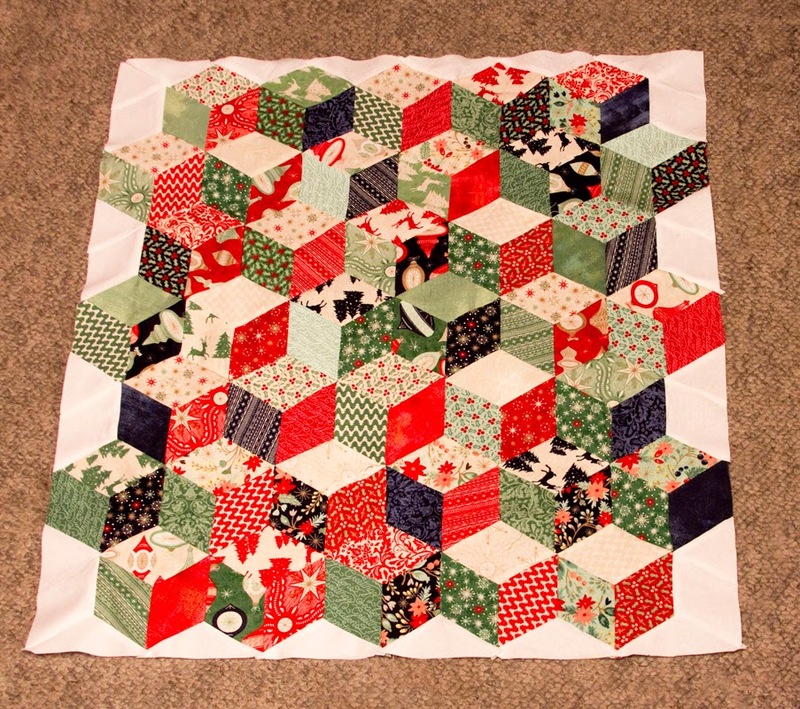 I used my walking foot and did straight line quilting on each side of the seams. I started and stopped each line of quilting where wedge one and forty meet (where I placed that pin earlier.) 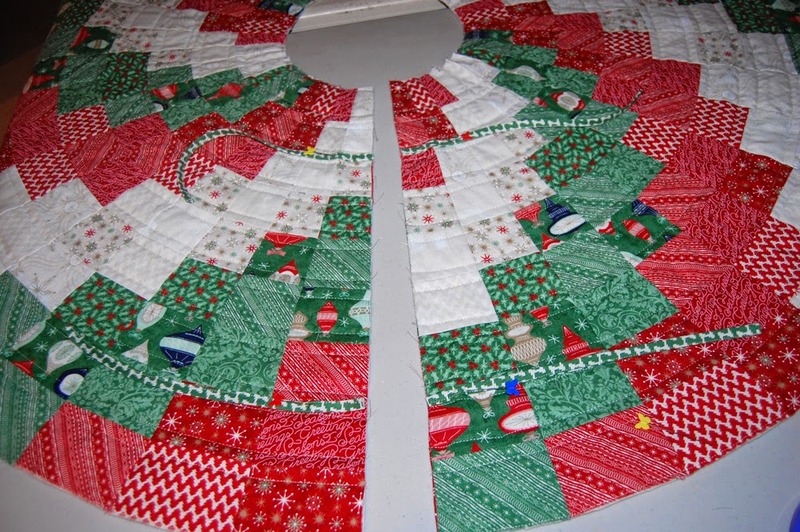 Be sure to do an 1/8th of an inch stitch around the inner and outer circle edges as well. 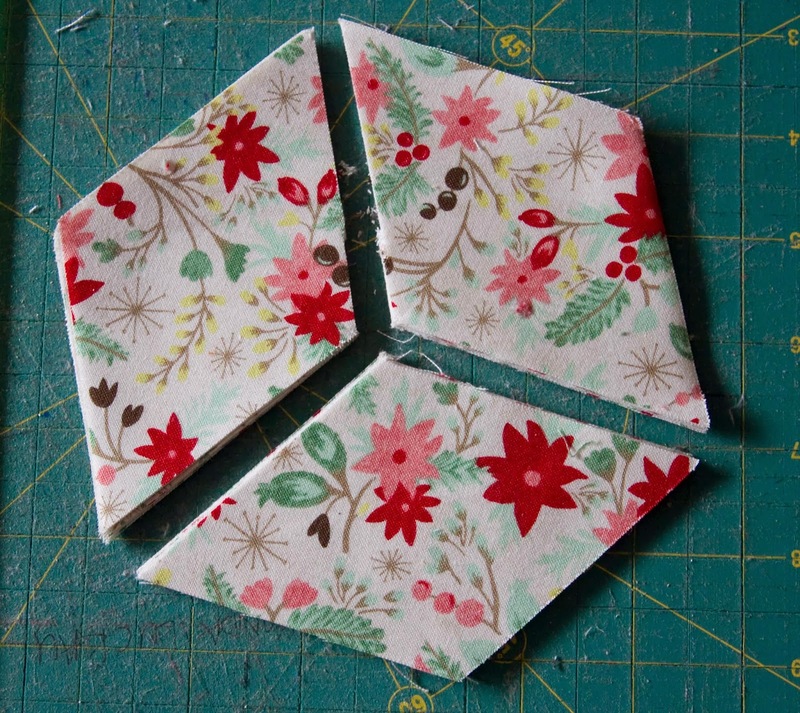 With your scissors, trim around the outer circle. Cut right down the seam where wedge one and wedge forty meet, then continue to cut the inner circle. 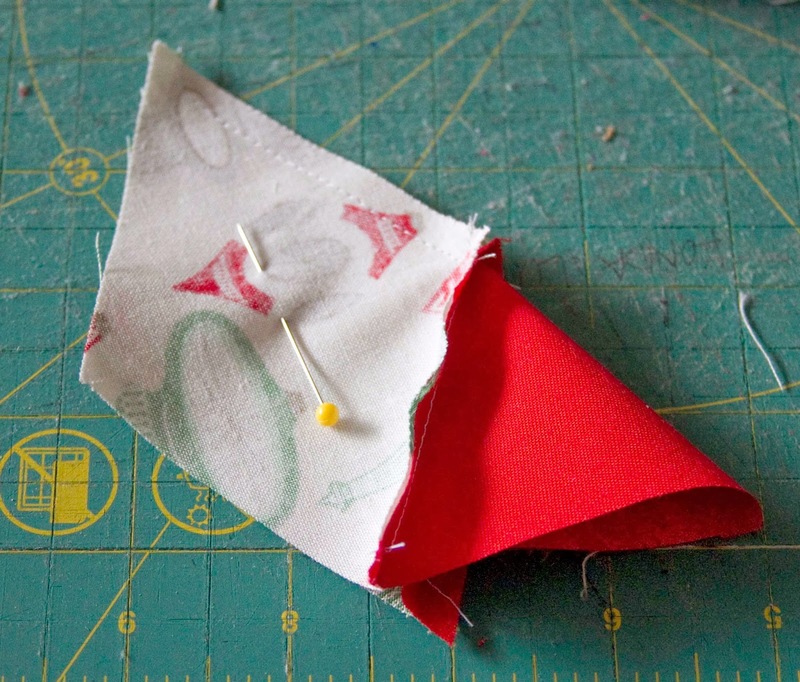 Make your bias binding. 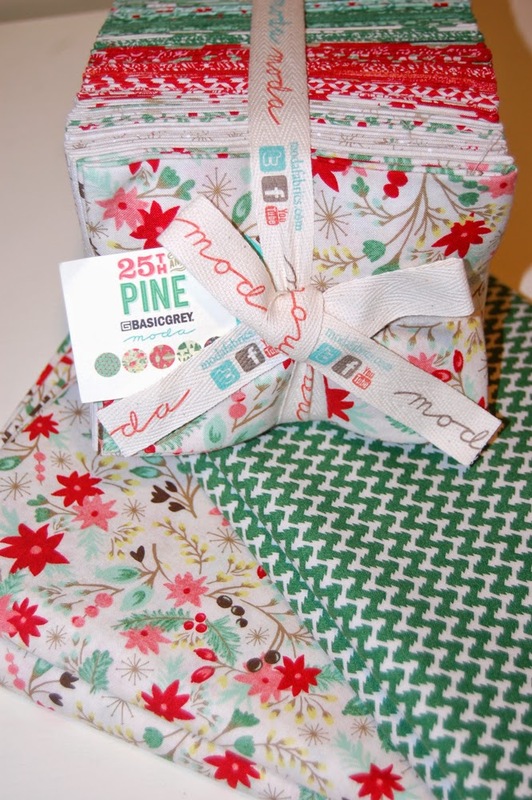 You’ll need approximately 240″ of bias binding. 1/2 yard will give you more that plenty! Lay out your 1/2 yard of fabric. Use the 45° line of your ruler to lop off the bottom left and top right corners of your fabric, approximately 10″ from the point. I do this so that I don’t have super short pieces of binding fabric. 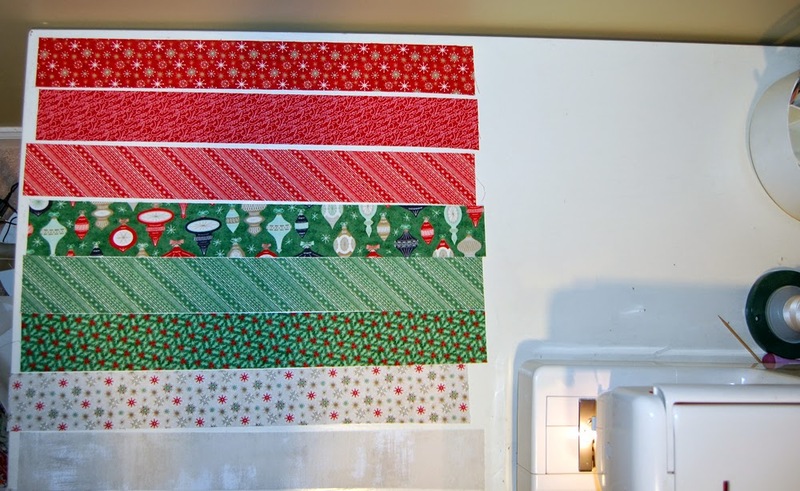 Keep the 45° angle going, and cut binding strips 2.5″ wide. If you want to make the optional ties, reserve two lengths, approximately 22″ long. 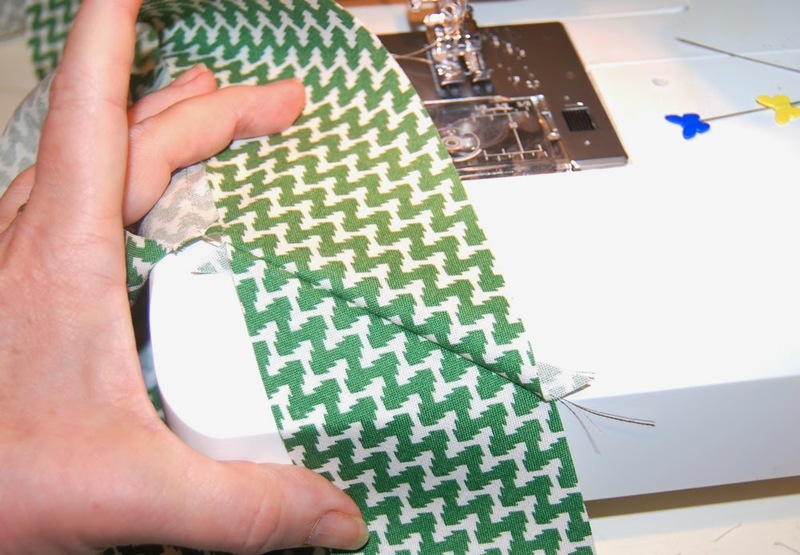 To join your strips, place two pieces together, matching the right angles. Place right sides together. The strips will be at a right angle. Be sure to off set the corner by a 1/4 inch, as shown in the picture. 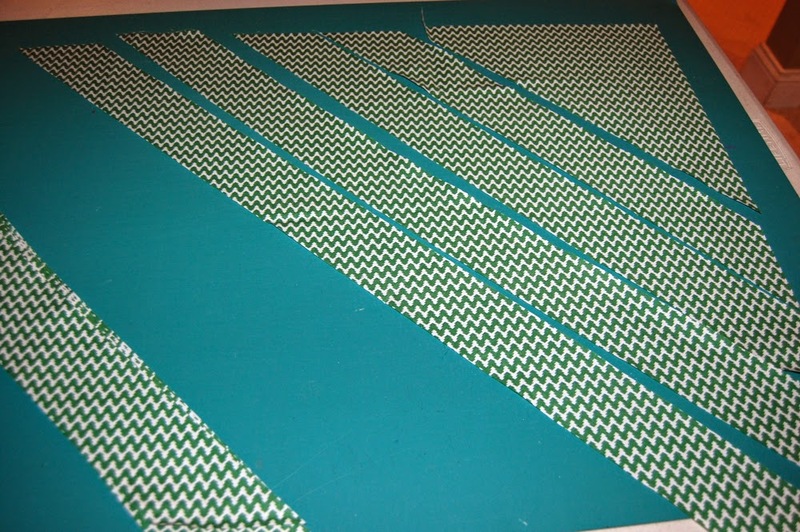 Sew strips together with a 1/4″ seam. 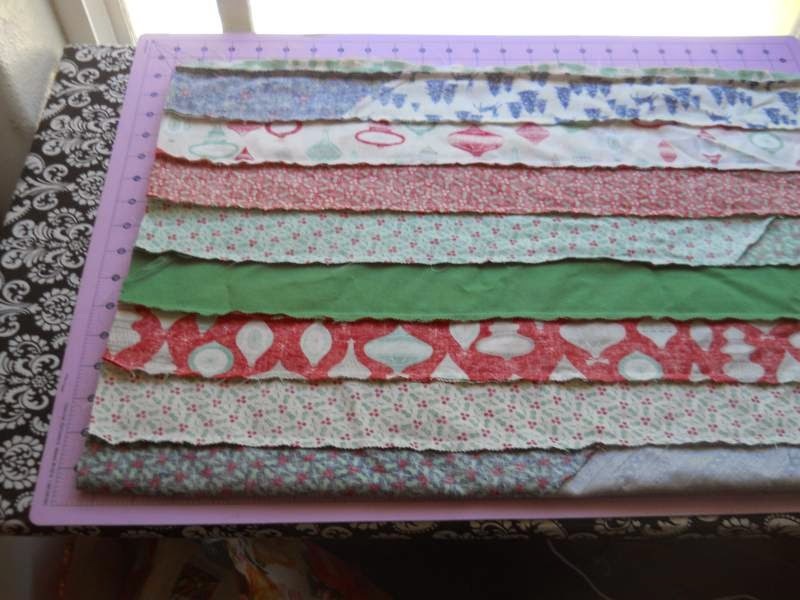 Continue to join all the strips until you have enough binding. Fold binding strip in half and press. Voila! Bias binding! 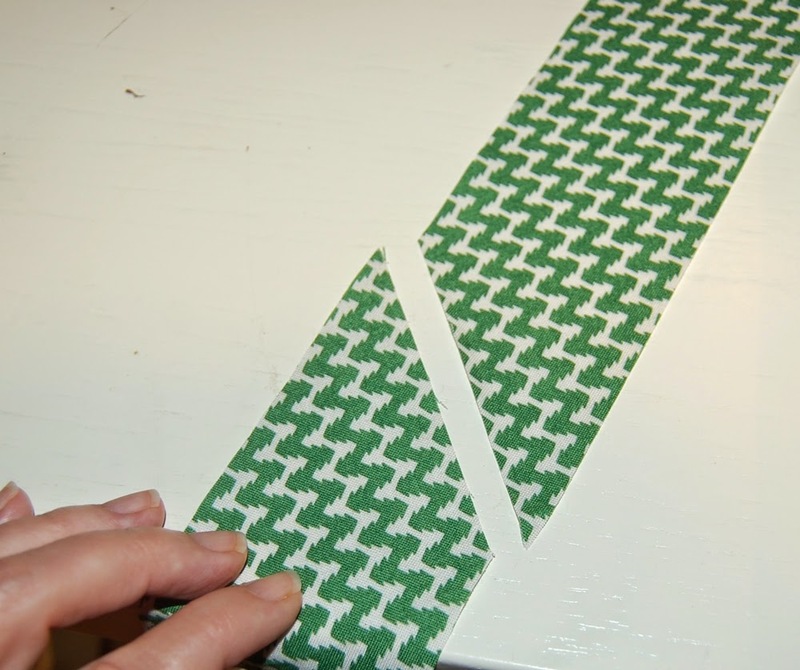 Optional ties: Take one piece of the bias binding strip approximately 20-22″ long. Fold in half length wise. Press. 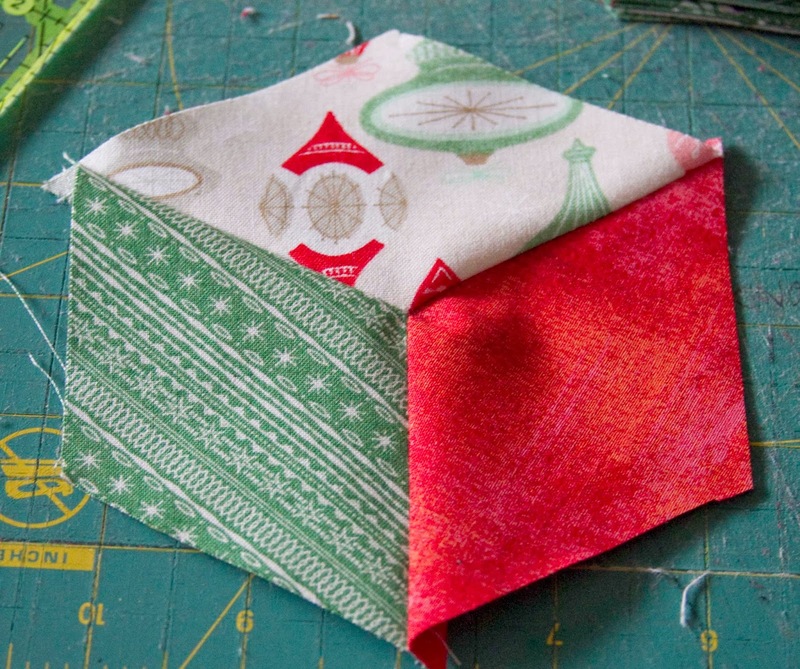 Unfold, then press so that each long edge meets the center “line” that you just pressed. 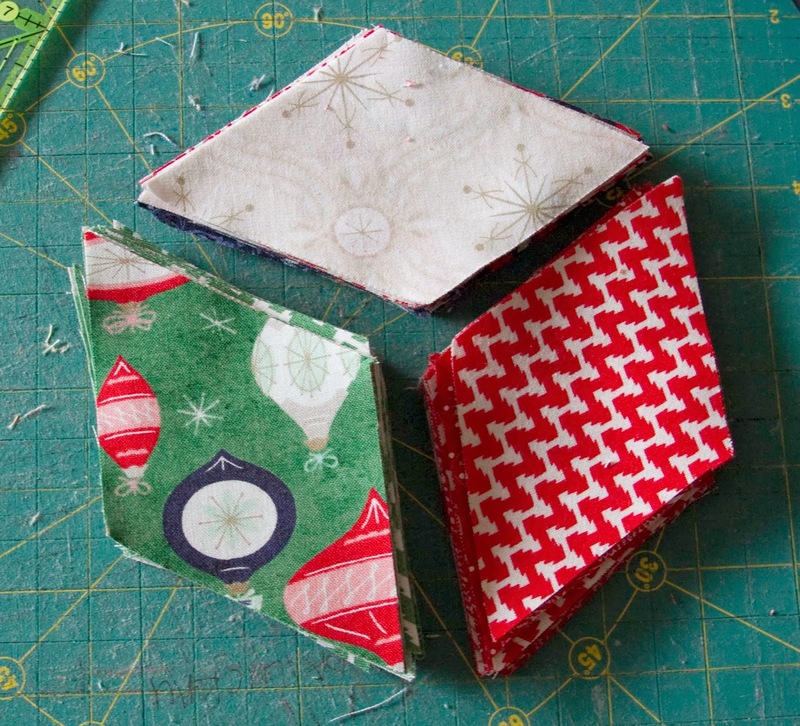 Fold each short end under 1/4″ and press. Re-fold and press entire tie. 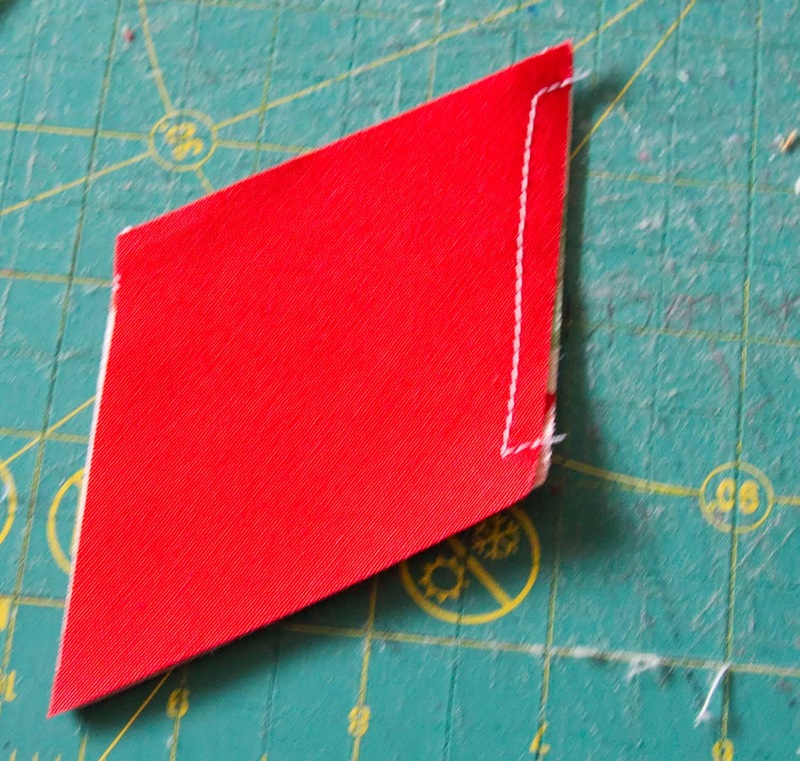 Stitch along the long edge and short folded edges, close to the open edge. 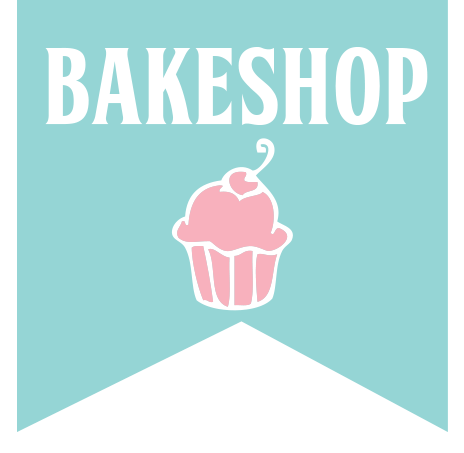 Cut into 2 lengths, approximately 10″ each. Repeat with second strip. Pin ties in place with raw edges together, approximately 4″ from inner and outer circle. 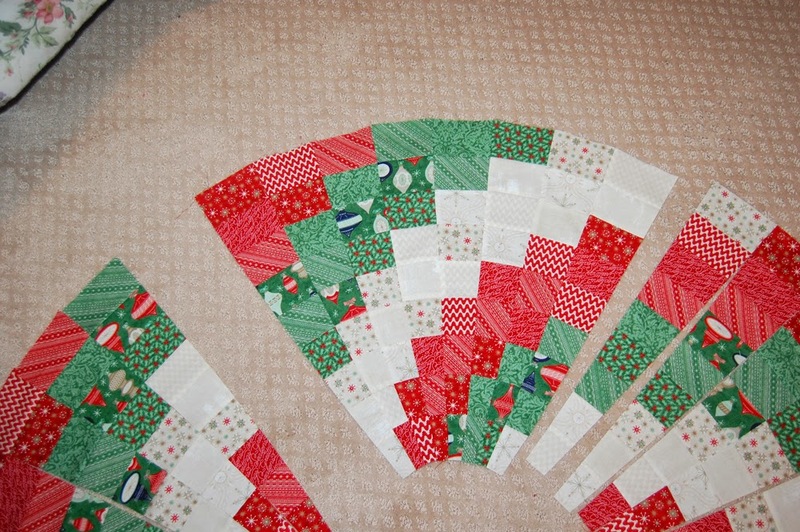 These will get sewn into the tree skirt as you sew on your binding. 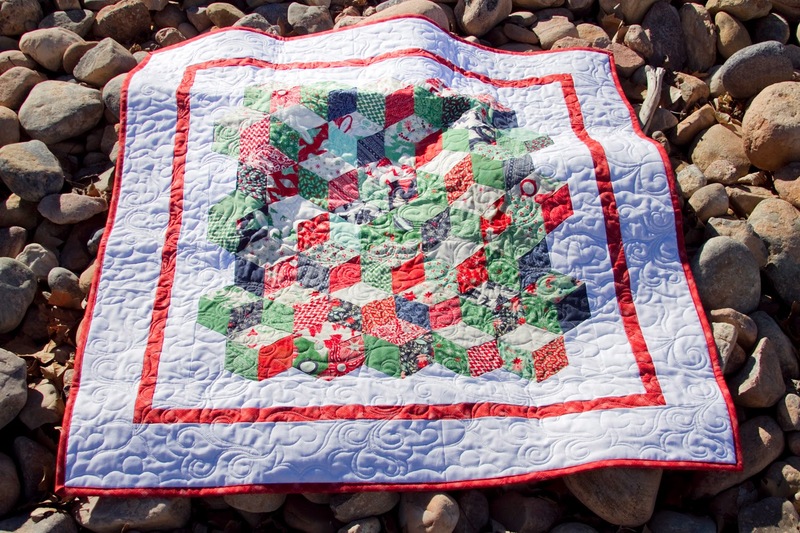 Bind your quilt. Congratulations ~ your first Christmas finish of the year! 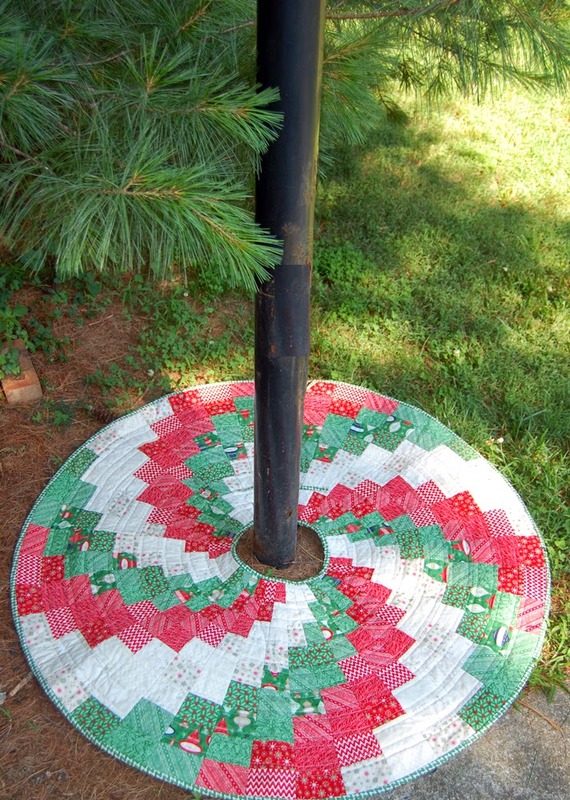 One Peppermint Swirl Christmas Tree Skirt, 45″ diameter.